AAANNNNDDDD…..once again it’s after 8pm and my day is finally drawing to an end and I find myself not motivated to write my gold rush story. It’s not that I don’t have an AWESOME story – it’s more about really long days of school learning REALLY challenging skills that is sapping most of my energy and attention – my first cat spay Monday, the start of the large animal reproduction block complete with rectal palpation labs Tuesday, and today was a four hour communication lab with actors that portrayed “challenging” clients – the angry, run on, grieving, broke, skeptical clients. So, I’m going to write a ride story that doesn’t do justice to Sunday instead of waiting too long and never doing it at all. Farley and I started the 50, rode 35 miles, and then pulled lame. It was the perfect ride. First, so that I don’t worry anyone….Farley is 100% fine. As in, 100% sound on the lunge at home 1 hour post ride. I didn’t ride in hind boots and at this point I think that the long sections of hardpacked gravel roads and random rocks took their toll and I think she’s a bit foot sore on those hind feet. So, lesson learned. For rides, it’s just not worth the risk to not boot all 4 – at least in my area where the trails are relatively rocky and hard. Looks like the only price to pay for *this* particular lesson was a pull that probably wouldn’t have happened otherwise. So why was it the perfect ride? Because everything about this ride went off exactly like a chapter in Aarene’s Endurance 101 book. I didn’t forget anything except hardboiled eggs and Tess’s dog food. My dog behaved herself perfectly (except for mugging Funder which was her own fault…) the entire 24 hours at ride camp. I visited with friends (Funder!) until it was a respectable time of the night to go to bed. We drank, we ate, and we TALKED. And it was the best thing ever. And there was a meteror shower that night and sometimes we shut up long enough to see the shooting stars. I tacked up and everything fit and went on the horse and there were no last minute diasters. I even had a saddle bag devoted emergency supplies – like a headlamp, zipties, bandage etc. They had changed the course so much that I wasn’t given a map, told it wouldn’t help me. So I took extra percautions in case something bad happened…..
Farley stood PERFECTLY still during the tacking procedure. It was a blood miracle. I thought she was still asleep. No spinning or anything. I finished tacking at EXACTLY the time the ride started. When I approached Farley with the bridle she woke up and was like “why aren’t we going already?????”. Farley started powerwalking towards the start line and it was clear that she KNEW her job and was NOT ready to retire and I could either come with her or not, but it was time to go and it was time to stop fussing and let her DO HER JOB. We powerwalked and jigged (just for show you know) on a totally loose rein out of camp. I called out my number and Farley immediately broke into an easy warm up trot. From that moment forward the ride was like magic. I didn’t have to touch the reins. A slight change of weight or a soft word and she went down the trail like we were telepathically connected. Farley 100% absolutely did her job that day with no fuss, no drama. She did EVERY thing I asked without argument or tension. She didnt’ pull on me or shake her head. Early on the ride I asked her to stand while I dismounted and took off her hind boots. She did so PERFECTLY with calmness. I got compliments all day on her and without me saying a word about her, people dropped the phrase “lifetime horse”. I would randomly get restless in the saddle and hop off to run. This ride is relatively flat, so it’s not obvious to get off an run down hill etc. When I got off I would run until I was tired – and didn’t just run downhills and flats – I ran UPhills! I can’t emphasize how much difference that Solstice saddle made. No pain, no discomfort and I truly felt in sync with my horse. There was such a peace to trot along a beautiful trail in the morning – so much in rhythm with absolutely no tension or stress. I remembered how ENJOYABLE endurance is. Every once in while we would canter for 10 or 15 strides across a meadow where the footing was good and it was so relaxed and perfect. Coming into the 35 mile check (vet check 2) she literally dragged me, trotting to a water trough and drank really well – which has been a struggle in the past on these cooler rides. Annnnnddddd….I got all A’s except for gaits at that check. Could I have put rear boots on her and rechecked and possible gone out on that last loop? Maybe. But it wasn’t worth the risk. At that point I hadn’t lunged her and with a lameness issue at Tevis, I didn’t want to do ANYTHING that might exacerbate it if it wasn’t just a rock or a footsore hind. And the footing on that last loop was NASTY. Not worth the risk for *just* a 50. Now, 50 miles is a respectable distance, and my motto has always been you’ve “gotta respect the distance” because it’s the times I DON’T that I get into trouble (like not using rear boots!). Fifty miles is a long enough distance that if you don’t dot your i’s and cross your t’s, lady luck might not be kind. (in contrast, 100’s is a distance that you can obssessively dot every i and cross every t and you might not finish anyways…but I digress). *just* a 50 isn’t meant to be dismissive of the distance or the ride – but this was a 50 that I was doing for me and Farley, to rediscover the joy of endurance. It wasn’t a stepping stone to another longer ride like most of my 50’s are. There wasn’t any mileage awards on the line. It would have been nice to get our 2014 miles in…..but I would rather start our 2014 season with a strong 35 mile conditioning ride looking forward to our next ride, than to push for a completion that means very little in the long run. The only reason to continue, or at least try to continue by re-presenting to the vet etc, would have been pride. And of all the lessons I have learned or not learned in this sport, the one I have learned VERY well is that pride is root of many poor decisions. So, in the end I got in a perfectly respectable 35 mile conditioning ride to start my 2014 season off right, with a horse that clearly is saying “I love my job” and is truly my partner, along with a reminder that the distance is to be respected (and thank goodness I could be reminded of that lesson on a local ride that I had very little invested in). 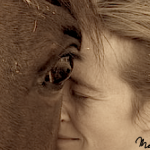 Lastly I was given a great gift: an endurance ride – that while not as invigorating as a 100 or a ride and tie – was a ride that makes me sigh in contentment as I remember just how perfect the bond between horse and rider can be. Sounds like the kind of partnership we all hope to have one day. What an incredible mare you have! Love this! So happy that you and Farley had such a wonderful ride! Oh and I ate when I was hungry and drank when I was thirsty and didn’t have to force myself to do either with nausea. And a million other small things. Nothing in this ride was a struggle…it just went off in such a lovely way. Sigh…..can’t wait to get out there again! I had to laugh when I saw the reference to a 100 as “invigorating”. Go back and look at your posts after your 100s with the litany of aches, pains, and general distemper. Methinks that hindsight wears rose colored glasses! LOL – I meant “mentally invigorating”. As in I start scheming and planning for how to do better next time etc. I agree that physically it’s ummm…less than invigorating. And Tevis ’13 was definiately a 100 that was NOT even mentally invigorating – but that was the exception. Love this! I totally feel you on the disappointment you can choose to embrace (see being totally over prepared and jazzed for Scrappy and I’s 50 then RO’ing at 20 miles), but the great partnership that should and does instead come into focus. Knowing your horse is okay and you and she/he are good to ride another day with the relationship and body intact if not stronger than ever is just wonderful. I’m sooooo glad this ride worked out for you! It sounds wonderful – there is nothing more meaningful than being in harmony with your horse, whether it is for a few seconds or 100 miles. Congrats on having a great horse!